Manila, 9 July 2018: Using a known intimidation tactic of the tobacco industry to jeopardize, weaken, or delay life-saving tobacco control measures all over the world, the Philippine Tobacco Institute (PTI), representing Philip Morris and other tobacco companies, has filed two court cases challenging the city government of Balanga for its anti-smoking ordinances. Like that of Davao City, the City of Balanga’s comprehensive anti-smoking ordinance is among the most progressive in the Philippines. Based on its vision for Balanga to be a world-class university town like Oxford and Cambridge in the UK, the city government enacted a University Town ordinance in 2008 and has been strictly regulating tobacco and alcohol use in the city since 2010, not only to protect the health of Balangueños but also to maintain an environment that is conducive for the well-being, welfare, and learning of the city’s youths. To complement its anti-smoking ordinance and with support of city residents, the city government passed Ordinance No. 16 series of 2016, also known as the Tobacco-Free Generation (TFG) Ordinance of Balanga City, which regulates the sale of tobacco products to all Balangueños born on or after 1 January 2000. Dominated by Philip Morris Fortune Tobacco Corporation (PMFTC), the PTI is challenging the city’s anti-smoking ordinances in the Regional Trial Court, which, according to the Southeast Asia Tobacco Control Alliance (SEATCA), is a clear case of David versus Goliath and hypocrisy on the part of Philip Morris International, whose website claims the company supports a smoke-free future and has funded the Foundation for a Smoke-free World. 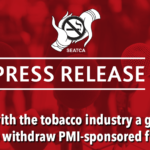 “SEATCA is disgusted that a multi-billion dollar industry is suing a small city like Balanga, with a population of only 96,000 people, for protecting its people from premature deaths and the harmful effects of tobacco. If Philip Morris is genuinely supportive of a smoke-free world, it should be supporting and not opposing Balanga’s efforts to protect present and future generations from the harms of tobacco and nicotine addiction, in line with the global health treaty, the WHO Framework Convention on Tobacco Control (FCTC),” said Dr. Ulysses Dorotheo, FCTC Program Director of SEATCA. By filing these cases against Balanga, tobacco control organizations worldwide including SEATCA are right that PMI is not serious about its commitment but just wanted a distraction from the many deaths its cigarettes cause. In fact it is not stopping sales of cigarettes, instead it is increasing its sales in ASEAN countries and has started to aggressively promote its new product called IQOS. “These court cases against Balanga prove the duplicity of Philip Morris’s claims, because, despite its smoke-free rhetoric, PMI continues to aggressively fight effective tobacco control measures,” remarked Dorotheo. Balanga City is a distinguished Hall of Fame awardee for the Philippine Department of Health (DOH) Red Orchid Awards for tobacco control. It has also received international recognition as a “healthy city” and was hailed as the first TFG city in the world by the TFG international organization based in Singapore.